Not to be confused with asymmetry of lift. Dissymmetry of lift in rotorcraft aerodynamics refers to an uneven amount of lift on opposite sides of the rotor disc. It is a phenomenon that affects single-rotor helicopters in forward flight. A rotor blade that is moving in the same direction as the aircraft is called the advancing blade and the blade moving in the opposite direction is called the retreating blade. Balancing lift across the rotor disc is important to a helicopter's stability. The amount of lift generated by an airfoil is proportional to the square of its airspeed. In a zero airspeed hover the rotor blades, regardless of their position in rotation, have equal airspeeds and therefore equal lift. In forward flight the advancing blade has a higher airspeed than the retreating blade, creating unequal lift across the rotor disc. When dissymmetry causes the retreating blade to experience less airflow than required to maintain lift, a condition called retreating blade stall can occur. This causes the helicopter to roll to the retreating side and pitch up (due to gyroscopic precession). This situation, when not immediately recognized can cause a severe loss of aircraft controllability. Envisage a viewpoint above a single-rotor helicopter in still air. 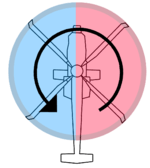 For a stationary (hovering) helicopter, whose blades of length of r metres are rotating at ω radians per second, the blade tip is moving at a speed rω meters per second. At all points around the disc mapped out by the blade-tips, the speed of the blade-tip relative to the air is the same: everything is balanced. Now imagine the helicopter in forward flight at, say, v meters per second. The speed of the blade-tip at point A in the diagram relative to the air is the sum of the blade-tip speed and the helicopter forward-flight speed: rω+v. But the blade-tip speed at point B, relative to the air, is the difference of its rotational speed and the forward-flight speed: rω-v. Since the lift generated by an aerofoil increases as its relative airspeed increases, on a forward-moving helicopter the blade-tip at position A produces more lift than that at point B. So the rotor disc produces more lift on the right hand side than on the left hand side. This imbalance is the "dissymetry of lift". Dissymmetry is countered by "blade flapping": rotor blades are designed to flap – lift and twist in such a way that the advancing blade flaps up and develops a smaller angle of attack, thus producing less lift than a rigid blade would. Conversely, the retreating blade flaps down, develops a higher angle of attack, and generates more lift. To reduce dissymetry of lift, modern helicopter rotor blades are mounted in such a manner that the angle of attack varies with the position in the rotor cycle, the angle of attack being reduced on the side corresponding to position A in the diagram, and the angle of attack being increased on the side corresponding to position B in the diagram. However, there exists a limit to the degree by which dissymetry of lift can be diminished by this means, and therefore, since the forward speed v is important in the phenomenon, this imposes an upper speed limit upon the helicopter. This upper speed limit is known as VNE, the never-exceed speed. This speed is the speed beyond which the aerodynamic conditions at the rotor tips would enter unstable régimes - if v was sufficiently fast, the rotor tip at position A would be travelling fast enough through the air for the airflow to change radically as the rotor tip became supersonic, while the rotor tip at position B might have insufficient net linear speed through the air to generate meaningful lift (the stall condition - known as retreating blade stall. Entry of the rotor tip into either of these aerodynamic régimes is catastrophic from the point of view of the pilot, and the maintenance of stable forward flight. The situation becomes more complex when helicopters with two sets of rotor blades are considered, since in theory at least, the dissymetry of lift of one rotor disc is cancelled by the increased lift of the other rotor disc: the two rotor discs of twin-rotor helicopters rotate in opposite senses, thus reversing the relevant directions of vector addition. However, as entry of the rotor tip into the supersonic aerodynamic realm is one of the unstable conditions that affects forward flight, even helicopters with two rotor discs rotating in opposite senses will be subject to a never-exceed speed. In the case of tandem-rotor helicopters such as the CH-47 Chinook, additional factors such as the aerodynamic drag of the entire design, and the available engine power, may conspire to ensure that the helicopter is incapable of achieving the VNE imposed upon it by dissymetry of lift. In the case of the Kamov Ka-50 "Black Shark", which is a coaxial design, it is possible for the helicopter to enter this aerodynamic régime as it has sufficient engine power, and pilots of this machine need to take this into consideration during the operation of the helicopter. This article is issued from Wikipedia - version of the 10/3/2014. The text is available under the Creative Commons Attribution/Share Alike but additional terms may apply for the media files.